Because the end goal was to make something that looked as though it came from the game itself, a lot of time was put into making sure that the externals were faithful to the digital version while still able to contain all the hardware they needed to cram in there. This is a fully auto gun, so it needed a battery and motors, as well as a way to feed the firing mechanism Airsoft BBs that didn’t require an anachronistic magazine sticking out. They combined a off-the-shelf firing mechanism and high-capacity magazine but it took plenty of custom designed parts to get everything mated up. 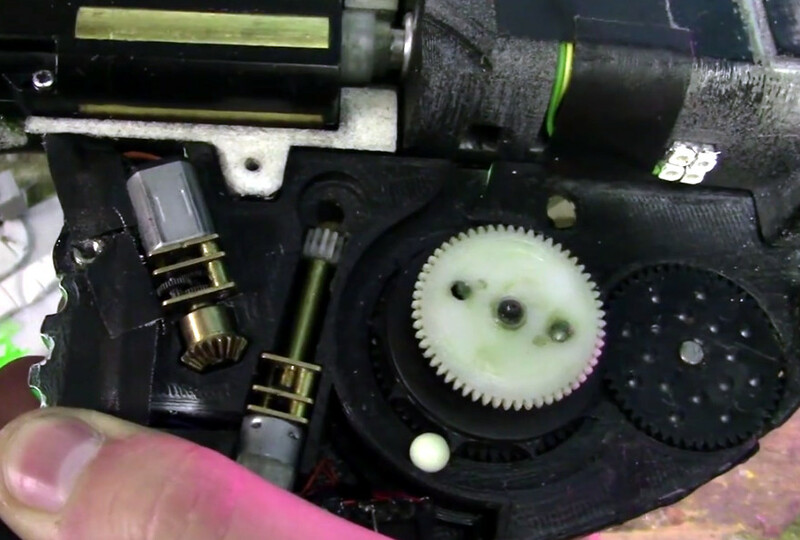 The magazine has a clockwork mechanism to advance the BBs which required the user to manually crank up, but this was replaced with an electric motor to make things a little more futuristic. In addition to all the LEDs on the body of the gun, there’s also an internal array of ultraviolet SMD LEDs to charge the glow-in-the-dark “tracer” BBs as they move through the magazine. In low light, this gives the shots from the gun something of a laser effect. We’ve seen 3D printed guns from games before, but rarely with this attention to detail and engineering. Honestly, this even gives some real 3D printed guns a run for their money. Alert the Washington Post! I’m sure they’ll want to cover this development.